After the successful breeding season of Scotland’s sea birds and an increase, at least temporary, of British butterflies this summer, comes the good news about Bitterns. Their recovery is remarkable because they were close to extinction as recently as 12 years ago. Extensive conservation work in wetland areas has paid off, particularly the restoration of dry reedbeds and creation of wet reedbeds. At least 82 booming males have been recorded in 2009, a high point since their total extinction at the end of the 19th century. Read more at the RSPB. Photo by Andy Hay. 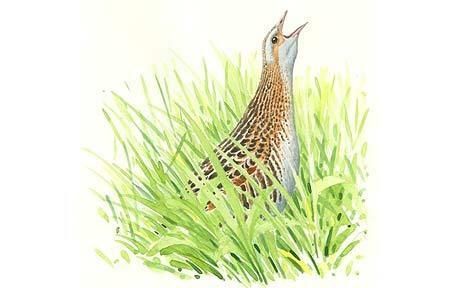 Corncrakes used to flourish in England when hay meadows were scythed by hand. But with the advent of modern machinery, they soon disappeared from English farmland, sliced to extinction as they sat tight on their nests. The Daily Telegraph reports on the return of their characteristic “crake, crake” call, heard again after decades of silence, as the species is reintroduced to the large Nene Washes nature reserve in Cambridgeshire.